We all know that life is an extremely fragile thing. We all see many people throughout the day as well, whether it is at work, school, or at the store. Chances are that at least three people will have some form of muscular dystrophy. The different types of MD can differ between physical appearance or just a lot of pain that only that person can experience. It is an extremely intense disease and unfortunately, there is no cure...yet. My name is Phillip, and I have muscular dystrophy. I have two kinds that affect up to four parts of my body. I have "Limb Girdle" which affects my shoulders, shoulder blades, chest, and hips. Then I also have FSH or Facioscapulohumeral, which affects my face and neck area. I found out that I had MD when I was a sophomore in High School of 2004. When I found out, it was not too bad. Not bad at all actually. I just accepted it and did all I could possibly do to stay active and healthy. The only "cure" my doctor said that could help was to stay active, which was ok with me because I grew up playing sports. Recently, I realized that it is not possible for me to extend my right arm straight up while I am standing up. The muscle that is supposed to be holding onto my shoulder blades is not holding them on the rib cage where they belong. So about every day or every other day, there is always a chronic pain right on my shoulder blade. Surgery is definitely in the near future and hopefully a real cure is as well. In my case, it could be a whole lot worse than this. 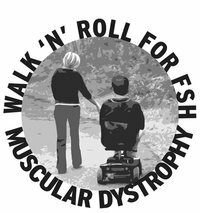 At least I can still walk because there are many people with muscular dystrophy who can not walk or even enjoy life anymore. Those are the kids that need to be in our prayers, and we can try to understand what it is like to suffer a disease such as MD. Let's all work together and find a cure, it can happen and it will be done.